Workers at Israel's main airport went on strike, grounding all departing flights and disrupting travel during the busy holiday season. 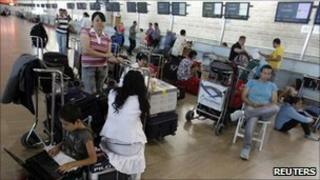 Unions representing staff at Tel Aviv's Ben Gurion airport declared the partial strike after pensions talks collapsed. The industrial action ended on Monday evening. Israel radio said the staff at the airport had received guarantees from the finance ministry that their pension funds would be protected. Flights already en route to Israel were be allowed to land, but no luggage would be unloaded, unions said. All departing flights were cancelled. Airport officials said talks were under way to try to resolve the dispute. The strike is expected to interfere with the plans of over 29,000 passengers travelling to and from Israel on Monday alone, Israeli press reports said. The strike comes in the midst of a busy holiday period, as families wind down Rosh Hashanah celebrations and prepare to mark Yom Kippur, the holiest day in the Jewish calendar. The Israel Airports Authority's employees' union is demanding guarantees that pension funds will not be used for other purposes.